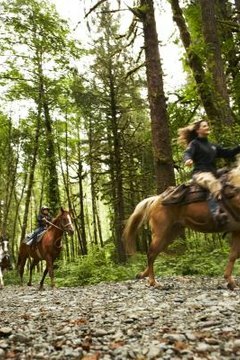 Going camping with your horse, especially on a multi-day journey, can be a truly enjoyable way to explore the trails less traveled You could be in for an extremely long walk home though if you are unable to keep your horse at your campsite and he heads home in the middle of the night without you. Before you set foot on the trail for your first overnight camping trip, your horse needs to be completely trained to accept both being hobbled and being staked out while hobbled. An inexperienced, untrained horse can panic when hobbled for the first time and seriously injure himself or break loose. A horse that is already trained and used to being hobbled can still find himself in a bad situation while hobbled but is far less likely to do so. Train your horse by hobbling him at home in a small pasture or enclosure. Gradually allow him to adjust to the idea of having his motion restricted. Your hobbles will only be effective if you use them correctly. Carefully brush dirt and debris off the leg before you attach a hobble to prevent sores. Hobbles are designed so that each cuff buckles around the horse's legs. Most hobbles feature either hook-and-loop closures, similar to those used on bell boots and splint boots, or metal buckles the same style as those used on halters. Each hobble has its own buckle. Check that the straps or chains between the hobbles are not tangled or twisted if you are using multi-leg hobbles. If you are going to use a picket line, the picket line will be attached to the front leg hobble closest to the stake. Hobbles can be used on one, two or three legs. Hobbles on both front legs can prevent the horse from going too far as well as keep him from pawing. A two-legged hobble can be used with a horse who is staked to a line. A three-legged hobble is used on both front legs and one hind. This significantly limits your horse's ability to go anywhere and works especially well on those horses who have figured out how to make significant progress away from your campsite even with both front legs hobbled. Three-legged hobbles are not commonly used with a picket line. Picket lines are lengths of rope that stretch between a stake in the ground and snap onto your horse's hobble or even his halter. The length and material of the picket line vary depending on the type you purchase. Some stakes have the ability to swivel while others do not. Ropes that have some give to them are preferable to those that do not stretch at all. Stretchy ropes are less likely to cause severe injuries if the horse becomes tangled. Picket lines are only attached to one hobble, and you should not have more than one picket line attached to your horse at a time. Most picket lines employ a swiveling quick-release snap to attach to the D-rings on your hobbles. You will need to obtain a hobble designed for use with a picket line and stake. Select a safe, flat, rock-free area with few trees or other obstacles. The fewer items there are for your horse to get tangled in, spooked by or otherwise upset by, the better. Make sure your horse cannot get the picket line tangled around a tree. Trees need to be outside his range of motion. If you are picketing multiple horses, the picket lines must be at least 8 to 10 feet away from one another to avoid tangling as well as limit interactions between horses. Before you plan to stake your horse out on a picket line or hobble him completely, you need to check the rules for the campground or trails you plan to use. Horses typically graze while hobbled, so if grazing is against the rules, you will be better off attaching your horses to a high picket line. Be careful not to use too many motion restriction devices at once, as your horse could be unable to extract himself should a bad situation occur. Outfitters Supply: Horse Hobbles prevent a long walk home.